PLEASE EMAIL US – AT info@VoicesFromWar.org – IF YOU ARE INTERESTED IN UPDATES ABOUT FUTURE PROGRAMMING, NEWS, & EVENTS! Kara Krauze is a writer, editor, and educator. Kara has worked in publishing, financial services, the mental health field, and community organizing. Her writing has been published in Quarterly West, Center: A Journal of the Literary Arts, Highbrow Magazine, The Daily Beast, Hypothetical Review, the Los Angeles Review of Books, Poets & Writers, and elsewhere. She has a B.A. from Vassar College in International Studies and a M.A. in Literary Cultures from New York University. Her writing, including a memoir and novels, engages with the subjects of war, loss, and memory. She has lived in Indiana, Ohio, and England, and is a longtime resident of New York City, where she founded Voices From War in 2013. Siobhan Adcock is a novelist, essayist, humor writer, and editor based in Brooklyn, New York. She is the author of two novels, The Completionist (Simon & Schuster, 2018) and The Barter (Dutton, 2014), as well as two humor books. Her short fiction, essays, and humor writing appear in Triquarterly, Salon, The Daily Beast, The Huffington Post, XOJane, and others. She has taught classes and workshops at the Columbia Publishing Course, the Gotham Writers Workshop, Cornell University, and the Auburn Federal Correctional Facility. She has also worked in digital and print publishing at Random House, HarperCollins, Conde Nast, the XO Group, Time Inc., and What to Expect Digital, the leading pregnancy app and website. Scott Reel is a former sergeant in the Marine Corps, serving four years as a combat correspondent and broadcast journalist. Following his service, Scott completed his B.A. in English and Philosophy at the University of Illinois Chicago. He is now the president of the Military Alliance at New York University, where he is pursuing his Master’s in English and American Literature. Scott has written for The War Horse, an award-winning non-profit newsroom, and published poetry in Illinois’s Best Emerging Poets: An Anthology and On the Back of a Motorbike. He currently lives in New Jersey. Jeremy Hussein Warneke is a United States Army veteran, who served in Iraq. Following discharge, he completed his undergraduate degree at Sarah Lawrence College. His publication credits include Itscomplicated.vet, NYC Veterans Alliance, Homefront Progressives, Task & Purpose, Scintilla, and elsewhere. In 2017, he was a War Horse Writing Seminar Fellow and a second place poetry finalist for Line of Advance‘s COL Darron L. Wright Award. In 2015, he received an honorable mention for photography in Proud to Be: Writing by American Warriors, Vol. 4. A former Voices From War participant, Jeremy launched The Craft of War Writing with support from Voices From War, The New York Public Library, and the Bronx Council on the Arts in early 2016. Nina Semczuk served as an Army Officer in various locations and units from 2011-2016. Prior to military service, she attended Boston University and graduated with a Bachelor of Science in TV and Film production. Nina has worked as a writer and editor at a financial tech startup, and is now the head of search engine optimization content at Fairygodboss, a startup. In 2017, she was a War Horse Writing Seminar Fellow. You can find her writing on SmartAsset, The Muse, itscomplicated.vet, The War Horse, Fast Company, and around the web. Nina started with Voices From War as a participant in 2016 and went on to become a Teaching Associate and Instructor. Nate Bethea is a writer and critic. He served as an Army infantry officer from 2007-2014, leaving the military in order to attend Brooklyn College’s Creative Writing MFA program in fiction. His work has appeared in McSweeney’s Internet Tendency, the Iowa Review, The Morning News, The Daily Beast, and The New York Times, and he is a contributor to The Road Ahead: Stories of the Forever War (Pegasus, Jan. 2017; eds. Adrian Bonenberger & Brian Castner). He holds a Bachelor’s in Journalism and French from Indiana University. Nate served as a Voices From War co-instructor for five seasons. John LoSasso is a retired high school English teacher, dean, and girls varsity basketball coach. Having worked and coached in New York City public high schools for thirty-eight years, he currently keeps himself occupied as an Academic Coach at Pace University-Pleasantville. John began pursuing a “dream deferred” when he started writing in earnest upon joining The Craft of War Writing as a student in 2016. That same year, his short fiction piece, “Buffalo Soldiers,” which emanated from the workshop, was accepted for publication in Proud To Be: Writing by American Warriors, Vol. 5. A native of Brooklyn, John currently resides with his wife in the Bronx, New York. Jeff Loeb, a former Marine who served in Vietnam, is a writer and educator. Jeff has taught English literature and writing at the university, college, and high-school levels; published numerous memoiristic essays and critical articles; and worked as a radio reporter. His essays have been published in War, Literature, and the Arts, American Studies, and African American Review, among other journals. He has a B.A. In English, Political Science, and History from the University of Kansas, as well as an MA and PhD in English, also from KU. His dissertation was on the literature of the Vietnam War, with a concentration on African-American memoirs of that conflict. He has written one novel and is at work on another, in addition to a memoir. He is the former Chair of English and Chair of Faculty Development at the Pembroke Hill School in Kansas City, Missouri, and presently lives in New York City. Jacob Siegel was born in Brooklyn where he lives now. He serves in the New York Army National Guard and was deployed to Iraq in 2006-07 and to Afghanistan in 2011-12. He worked as editor of The Hero Project at The Daily Beast, a site featuring veteran writers and their stories. Jake was a co-editor and story contributor to Fire and Forget: Short Stories from the Long War. His writing has also appeared in The New York Times, The Daily Beast, New York Press, and elsewhere. Jake served as a co-instructor during Voices From War’s first year of workshops. Jacob Siegel is a new 2017-2018 LABA Fellow (Laboratory for Jewish Culture) at the 14th Street Y (host to Voices From War workshops since our inception in 2013). The new LABA Fellows will be exploring WAR + PEACE for the 2017-2018 season. 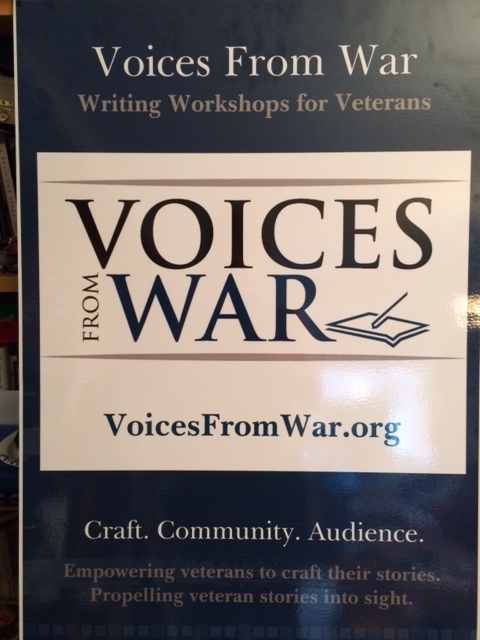 In this workshop we write our own narratives, while reading excerpted fiction and non-fiction by veterans, military spouses, and select civilians. Each week we share student work, learning from each others’ strengths and successes, while also discussing ways we can come closer to the stories we want to tell, whether just for ourselves or for a larger audience. Excerpted texts have included writers such as Phil Klay, Anatole Broyard, Tim O’Brien, Janine di Giovanni, Benjamin Busch, Viet Thanh Nguyen, Mariette Kalinowski, Grace Paley, Isaac Babel, Claudia Rankine, George Orwell, and others. Thank you to our gracious GUESTS! We have had the pleasure of hosting GUEST WRITERS and publishing professionals, including Peter Blackstock, Benjamin Busch, Cathy Linh Che, Maurice Decaul, Jofie Ferrari-Adler, Boris Fishman, Nicole Goodwin, Phil Klay, Donna Miele, Roxana Robinson, Rob Spillman, and Christopher Paul Wolfe. NYC-Manhattan: Wednesday, 7:00 – 9:00 p.m.
Our NYC-Manhattan class is hosted by the 14th Street Y. Thank you to The Rona Jaffe Foundation for ongoing support 2016-2019! Thank you to the Bronx Council on the Arts for support for The Craft of War Writing from 2016-2018! Thank you to the Lower Manhattan Cultural Council and New York City Department of Cultural Affairs in partnership with the City Council for support in 2017, 2018, and 2019! Thank you to Amazon Literary Partnership for grant support, 2017-2019! Our NYC-Bronx class is hosted by the Morris Park NYPL.